I’m beginning what I think will be an ongoing look at All About Spelling – I plan to keep posting about it as we progress further through the curriculum. *Please note: I’m an affiliate for All About Spelling, though I did purchase the curriculum on my own and this is not a compensated review. Is cluttered, uses Microsoft Word-style clipart, and features five different fonts and six different font sizes on a page. Requires the teacher to spend extensive time in preparation to teach it “their way”. Is strongly tied to a one-lesson-a-day schedule. I picked All About Spelling because it seemed to avoid all three of those, and so far, it’s met my expectations. Maybe I shouldn’t care so much about what a curriculum looks like. We’re supposed to be teaching spelling/reading here, not graphic design, right? But, I think that a clean, simple interface is conducive to keeping a student and parent focused on the content instead of the fluff around the page. All About Spelling is laid out in a very clean manner and is modern-looking. I’ve never once been annoyed at their poor formatting or inconsistent styling. I find it easy to simply open the All About Spelling book, read through it once (usually a 1-2 minute process), and then teach. Obviously, we are dealing with simple first grade phonics so it shouldn’t be too complicated anyway, but I know that the other phonics programs I looked at did manage to overload the teacher with tons to read and no clear direction as to where to start or what to do. All About Spelling gives step-by-step instructions that can basically be read as a script. I find this to be very easy to follow without making me feel like it’s holding my hand. Set the tokens aside and put the following letter tiles in a row in front of your student: a, r, t.
The instructions are brief and clear enough that you can read them to the student without them feeling like you are giving them a half-hour lecture. Yes, you can do more than one lesson a day, but it really seems like that gets tedious when half the lesson is review. One of the reasons I’m homeschooling is so that my kids can learn at their own pace, be that faster or slower or with more or less review than a curriculum dictates. 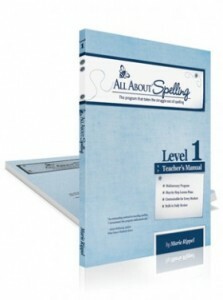 All About Spelling Level One has 24 steps, in which each step is a chapter each. Each step or chapter basically focuses on one phonics rule. There really is no indication as to what pace you are supposed to go; the curriculum encourages you to move as quickly or slowly as it takes, simply making sure the student has mastered each step before moving on. Some weeks, we go through one step; other weeks, it’s two or three. We completed Level One in about six months with my first grader (and probably could have gone faster if I wasn’t pregnant and tired!). I’ve not been homeschooling for long enough to know the nuances of what makes something spelling curriculum or reading curriculum. Though it’s not technically marketed as such, we are using All About Spelling as our reading program and it seems to be working quite well. I suppose that if I was only teaching how to read and not how to spell, we could move a little faster and my first grader would be reading more advanced words. However, reading and spelling really go hand-in-hand and I think I might feel as if we were backtracking if we jumped way ahead in reading words that the student had no idea how to spell. I do have to remind myself not to compare what we’re doing to what others are doing. 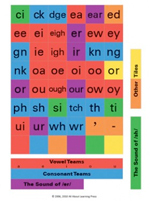 We just began to learn what causes a vowel to make its long sound at the end of Level One, something I know most reading curriculums teach much faster. But, my student can correctly spell every word he can read, and can explain why it’s spelled that way, something that I don’t think is as common with other programs. All About Spelling does a pretty good job of equally incorporating auditory, visual, and kinesthetic learning. I love that it’s not tied into one method; some days, we only use the auditory exercises, other days, it’s only the visual or kinesthetic. And some days, we use all three. The variety of exercises (letter tiles, tokens, flashcards, verbal exercises, and writing) help keep the student engaged even when reviewing the same concept over and over, and it also allows me to give the student a choice in how we do the day’s lesson. My first grader loves to write some days and some days he hates it, so often I’ll let him choose if he wants to spell with letter tiles or spell on paper. All About Spelling has no workbook or worksheets included. I found it helpful, especially at the beginning, to simply make my own worksheets where the student fills in the beginning or ending sound of the word for an object, for example. Though it would be nice if it included some worksheets, I enjoyed making my own based on what the student needed to review and I already admitted I think a lot of clipart is cheesy so I’ll probably continue making my own even if they added some sort of worksheets. All About Spelling is not technically a reading program, so it also has no reader included. However, they have recently come out with All About Reading, which has a workbook and reader. 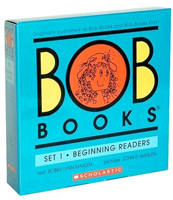 We went through All About Spelling Level One without a reader, and just supplemented with the Bob Books (Set 1) and, I admit it, we printed out the sample PDF for the All About Reading Level One reader. We ordered the All About Reading Level 2 reader to go through as we enter All About Spelling Level Two (the spelling book indicates which chapters in the readers correspond with the lesson), and if I didn’t try to go through Spelling Level One relatively quickly, I think we’d have ordered a Level One reader, too, since most other easy readers have a lot of sight words and All About Spelling has no sight words (at least not in Level One). We’ll be continuing to use All About Spelling as our primary reading/spelling program for the forseeable future. I’ll let you know how it goes! You can click here to visit the All About Learning website to find out more about All About Spelling and All About Reading. 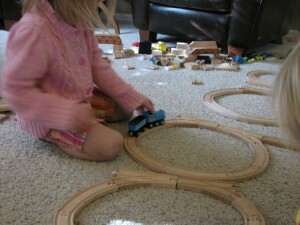 This morning we used our Melissa and Doug train set as a learning tool for language arts! 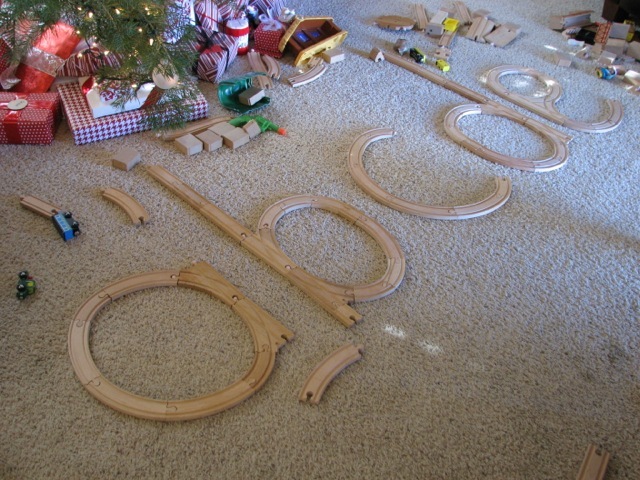 We formed letters using the tracks, and then practiced proper letter formation by driving the trains around the letter tracks. 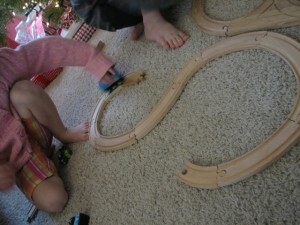 Miss Preschooler definitely benefited from this, and though First Grader is pretty good about proper letter formation, even he had to think about how to drive the train around the track properly, making me think this is a great way to reinforce letter formation even if you think you know it! We’ve recently begun incorporating a foreign language into our homeschool agenda: American Sign Language. I never particularly thought we’d be doing a foreign language in first grade, but several months ago, I felt God laying it on my heart to refresh my knowledge of ASL and begin teaching it to my kids. In short, I don’t particularly know why I feel that God wants us to learn (or in my case, re-learn) ASL. Will our next child be deaf? Will there be an accident that causes one of us to lose our hearing? Will someone enter our life that is deaf? Are we supposed to reach out to the deaf community? All of those thoughts swirl around in my head as we learn ASL, and I have no idea which one may be true, or if any of them will ever be true. Thinking about different cultures. I’ve been able to to explain that deaf people are normal, they just need a special language to communicate. It’s been valuable to even briefly consider what it might be like if we couldn’t hear or if someone in our family couldn’t hear. Coordination and attention to detail. Most ASL signs require somewhat precise finger positions and motions. Careful that you sign orange and ice cream just right or you might be saying something totally different than you think! This is helping all of my kids with their finger dexterity and preciseness. Non-verbal communication. ASL seems to depend a lot on facial expressions to properly communicate. If you’re asking a question, you certainly want to have a questioning look on your face. If you’re signing “angry”, you wouldn’t do it with a smile on your face. This comes naturally, as most people use their facial expressions to reinforce what they’re saying in any language, but it’s been a good reminder for me and my kids to be expressive with our body language as we sign (or speak). Secondary drama class, perhaps? Understanding English better. ASL doesn’t have a sign for every single word in the English language. As a result, you either fingerspell (slow!) or otherwise translate the English word into a word that ASL does have a sign for. I’m now much more tuned into the songs we sing at church, thinking about what the words really mean and how I would translate them for a deaf person. At some point, we will need to start learning more of the “grammar” of ASL and become better at understanding others when they sign. I may be looking for a more formal curriculum in a year or two, but for now, we’re having a blast learning signs and communicating with each other in sign language! Well, I’m now a homeschooled homeschooler. Somewhat of a “pioneer”, I think: mine seems to be one of the first generations of those who were homeschooled who are educating their own children at home. I never really thought about it much until we started getting closer to the point of having school-aged children, but I really love that I was homeschooled. It was all I knew at the time, and though I never disliked it or wished to do anything else, I didn’t realize what a unique opportunity I was given or how I would benefit from it later in life. Now that I see the lessons I learned, specifically as a result of opportunities I had as a homeschooler, I’m becoming passionate about educating my own children at home. I once thought that I primarily wanted to educate my children at home in order to teach them from the perspective that all truth comes from God. The more I consider my own homeschool education, the more I realize that learning that all truth is God’s truth was a great benefit of being homeschooled, there are so many other “non-religious” reasons that I believe homeschooling is the best way to prepare my children to live in the uncertain world in which we live. Here are some of the things that I feel were great benefits to being homeschooled, and benefits that I hope to be able to give to my own children. Because the actual bookwork took so little time, I had lots of time to be able to do other things: whether it be reading (I loved to read), creating items to sell at my parents’ craft fairs, building websites, working part-time jobs, or a host of other things. I had time to develop skills and talents in areas that I was interested in – time that most other students spend in the classroom or doing homework. I want my children to have plenty of time to devote to the things that interest them, to build their own creativity and develop their own dreams and ideas. Very little about our homeschool was segregated by age. Even in activities with our homeschool group, we were divided into groups of elementary and high school, so I learned to interact with other kids of all ages. Because I had opportunities to work in my parents’ business, I learned how to relate to adults. I often played tennis with my grandpa, and we had a weekly lunch outing with my grandpa, so I was comfortable with the elderly. I certainly generally preferred doing things with the people my own age, but because I was often in situations were there were a variety of ages, I learned how to respect those who were older and lead those who were younger – and learn from all ages! I want my children to know how to act among people of all ages, just like they will need to for the rest of their adult lives. As I’ve written about before, there wasn’t a lot of class time in our homeschool: my parents taught me how to teach myself. They guided me along the way, and made sure that I was actually learning, but I primarily went through my schoolwork independently. Just like everyone else, there were gaps in my education, but I have no doubt that should I ever need or desire to learn more about biology, I would be able to do that because my parents taught me how to seek out knowledge on my own. In today’s constantly changing world, we can no longer be assured that the skills we learned in high school or college are the skills that we need to thrive twenty years from now. I want my children to be equipped to know how to learn more about anything they desire, without having to take a class or be assigned a lesson. I want them to be able to decide they want or need to learn something, and just do it. Well, that’s my homeschool background. It wasn’t perfect, but I firmly believe that my parents gave me the best education possible for me. I can’t hope to perfectly educate my own children, but I can strive to equip them to be prepared for the rapidly changing world in which we live. High school was busy for me. Between teaching piano and working a waitressing job, I still helped out with my parents’ business, and was also very active in our church’s youth group. There were organized homeschool sports in our city, but I never had a huge desire to spend four mornings a week at practice and three nights at week at games. Our homeschool group had a volleyball class on Fridays, which was one of my favorite extracurricular activities. During my senior year in high school, I took two classes at a community college: Introduction to Macromedia Flash and College Algebra With Review. I didn’t learn much in either class, but I now have eight hours of college credit so I can now answer “some college” on surveys. It was my first time being graded on a curve! On a whim, I figured out how to create a website. This was back in the early days of the internet, when most of us were on AOL. I used AOL’s website builder to build a site of my own with links to some of my favorite websites, and then I decided it would be fun to create a site for my church’s youth group. Hello, black backgrounds and white text! Around this time, I started chatting online (remember AIM?) with a friend from youth group – who later became my husband. He was thinking of starting a web design business and wanted to know if I wanted to be his graphic designer. It sounded like fun, and I happened to think he was a great guy, so we collaborated on a couple of sites. I purchased Macromedia Dreamweaver, Fireworks, and Flash, and taught myself how to use those programs. September 11th happened, and somehow a friend (now my husband Jeremy) managed to purchase September11.net in the hour or two following the attack. We created a site and updated it frequently for the next couple of months as new information was released about what had happened. Social studies may not have been the strongest part of my homeschool education, this event and the work we put into researching what had happened was a crash course in current events. It was not official part of my homeschool assignment in any way – it was just our response to what had happened. I was thrilled when I discovered the site, which had long since been let go, has been archived in the Library of Congress’s September 11 Web Archive Collection. It’s kind of cool to see something you did on a whim in high school be considered significant enough to be archived by the Library of Congress! About halfway through my stint as a piano teacher, I began working as a server at a local restaurant. As strange as it may seem, I really liked this job, and continued working there for over two years (a long time in the restaurant industry!). Though there were always those people that never tipped, or tipped poorly, I found that serving was performance-based pay, and I was motivated to serve better so I could make more. The restaurant that I worked at was a locally-owned chain that was, frankly, dying. (I didn’t actually quit; the restaurant closed and I didn’t want to transfer to a new location.) As a result, they kept as little staff as possible, so we were almost always busy. We often served sections of five to ten tables at a time, and I learned a lot about multi-tasking! The staff was usually limited to two or three servers, a manager, cook, and dishwasher. We prepped our own salads, desserts, drinks; and bussed our own tables. The restaurant had a lot of regulars, and I enjoyed building relationships with these mostly-older people. Seniors tend to be very particular about their food – it must be the exact same way it’s been for the past thirty years – so learning their likes and dislikes and who was easygoing and whose order you did not want to mess up was a big part of making your shift go smoothly. I never felt unsocialized or cut off from the real world during my homeschool education, but my life primarily revolved around church and homeschool activities, so working in the restaurant industry was an eye-opening experience. There were an awful lot of words I’d never heard before, some of which might have been nice to know what they meant so I knew whether the remark was funny or nasty, but overall I’m glad I wasn’t constantly exposed to vulgarity growing up. I was offered a manager position at one point, but knew I didn’t want to work the crazy schedule of a restaurant manager so I kept waitressing until the restaurant closed. I certainly never had trouble communicating or getting along with my coworkers, and was well-respected by those I worked with. They knew I was different, but that was primarily due to the fact that I was a Christian and acted like it – not really because I was homeschooled. Other than working in my parents’ craft business and doing odd jobs here and there, my first real job was teaching piano. At the urging of my mom and piano-teacher sister, I began teaching on my own when I was a little older than sixteen. The students I taught were mostly people that I knew from church, and many of them were referrals from my sister, whose own piano studio was full. My piano studio grew to about ten students, and their ages ranged from kindergarten to junior high. Most were homeschool students, but I had a couple of public school students as well. My sister was my teaching mentor, and while I was teaching I had several opportunities to attend college classes and music teacher groups with her. During my piano teaching stint, I learned a lot from my sister about teaching. Rewards, incentives, deadlines, motivation, creativity, building relationships, letting relationships go, working with parents, enforcing policies… The lessons I had the opportunity to learn at this time were huge for a high schooler. Teaching piano was a fabulous opportunity for me, but it wasn’t a passion. Perhaps the biggest lesson that I learned from teaching piano was this: in order to teach others, you have to have a passion for the subject yourself. I enjoyed playing the piano, but didn’t have a passion for it. There were parts about teaching piano that I enjoyed, but I didn’t have a burning desire to teach this particular subject. After a year and a half, I held our final spring recital and quit teaching. I had given my students a quality education, but couldn’t continue trying to motivate my students to do something that I wasn’t motivated to do. I had learned a valuable lesson: in order to transfer passion, you must be passionate. It’s something I’ve remembered for the rest of my life. My parents have had their own “part-time” business for as long as I can remember. In the 90s, handcrafted home decor items were really in, and my parents made everything from wooden display shelves to decor designed with antiques to floral arrangements. At that time, the primary way my parents marked their goods was at arts and craft shows. Late summer and fall were the busy times for these shows, and I often accompanied my parents to these events. From an early age, I was learning how to run a business: setting up the displays, helping with customer service, creating marketing materials, attending the booth when my Mom needed to step away, and even running the cash drawer. My mom insisted that I counted back people’s change to them: “Your total was $57.53 and you gave me $60, so here’s 57.54, .55, .65, .75, 58 dollars; 59, and 60 dollars.” (This was a relatively easy skill to learn when you weren’t allowed to use a calculator for math.) I was shocked that the cashiers at Walmart didn’t seem to know how to do the same thing. I made and sold my own products at my parents’ booth, too. At first it was simple things, like a fabric candy cane pin that my mom designed and I would cut out, sew, and stuff. I remember making Christmas “wreaths” from old puzzle pieces that we spray painted green, glued together in a circle, and used the top end of a sewing pin to make little dots that looked like holly. Amazingly, these items sold and I made some money! People must have bought them because they thought I was cute, or else there were a lot of people that liked junky crafts in the 90s. Eventually, my dad taught me how to use a band saw, and I would cut out simple shapes for my own crafts, as well as my parents’. I remember designing a nativity set on my own – the first project that I remember being more than “little kid cute”. We sold quite a few, at a price of around $10-12 each, I think. I learned quickly that we priced everything at $x.95 because it appeared to be less to the consumer – so items were $9.95 instead of $10. This gave me some awareness of this price tactic as I made my own purchases, too. I used plenty of my mom’s supplies for making these crafts, but also had to purchase some of my own as I actually started making significant items. That was a fabulous way to learn about using money to make money. My parents’ willingness to let me (and my siblings) take part in their business was a huge boost to my education. The opportunities to learn business principles, develop new skills, and be inspired to be creative were priceless, and it’s one of the things I value most about my education. Though I never realized it at the time, reading introduced me to many different types of people and cultures, and made up some for boring history classes. I read everything from books to newspapers to magazines. My husband, who is good at history and geography, is sometimes amazed at the different historical figures that I can name, and the only thing I can attribute it to is reading. Every year, the students in my sister’s piano studio would study and prepare pieces not only for our two annual recitals, but also for Music Progressions, a sort of testing program at a local university. We would be quizzed on music history, music theory, sight reading, and ear training; and then perform one or two pieces for the adjudicator, who was typically a professor at the university, at least for the more advanced levels. This program had varying levels, but was in no way connected to the student’s age; a concept that I think we’d do well to think about applying to other educational opportunities. In junior high and high school, I also took part in an annual piano performance event. Each student would prepare one (or two, if they were short) piano piece and perform it in a concert hall before a judge, who would give a grade of one, two, or three and critique the piece on paper. Once, I went to the state piano teachers’ convention and received an “honorable mention” in a similar type of competition. Practicing the piano was part of my lesson plan for school, and I practiced for 30 minutes a day when I was younger, and an hour or so during junior high and high school, when I was more active in music and considering it as a college major. I often accompanied our church’s youth and children’s choirs, and played for congregational music. I liked music, but it wasn’t my passion. I often wanted to quit, and my mother always threatened with “if you quit, you will not be allowed to touch the piano again”. Well, I didn’t love music, but I did like playing, so that threat always kept me from quitting. Two of the weaker links in my homeschool education were social studies and science. Hopefully they’ve improved it by now, but Bob Jones science and history were terribly boring in the 90s, and we didn’t do a lot to amplify them. Once, my mom entered me into the homeschool geography bee. I did not do well. (My future husband won that bee twice and went onto the statewide geography bee once.) Why wasn’t I entered in a spelling bee, or a show-your-work at math bee? I could have aced those! I remember taking the Iowa Test of Basic Skills a couple of times. I don’t think it was required by our state, but my parents wanted us to do it to make sure we were learning everything we were supposed to be. Those were easy, even if I didn’t know my history or geography very well. Hello, multiple choice math problems? Who could not get those right? I vaguely remember taking extra schoolwork to work on in-between the different sections of the ITBS tests. Goodness, homeschool parents were slave drivers! I scored well on those tests, and my parents were probably relieved to know that they were giving me a satisfactory education according to state standards. During my junior year in high school, I took the ACT. I don’t remember my score (a 28, maybe?) but I know I did amazing in English, good in math, and guessed at everything else. That was enough to get me a well-above-average score, so evidently everyone else has some holes in their education, too. Links on this site may be affiliate links, which means that some websites will pay me a small percentage or fee if you purchase a product or sign up after clicking on my link.